Your Florida Keys guide to planning a Key West destination wedding — discover wonderful venues, travel ideas, plus see pictures from real Key West and Florida Keys weddings. Let’s start with your wedding cake. It’s probably the most important cake that you’ll ever select, so it’s important to know which works best in a tropical destination. Visit the web sites for the various Key West wedding cake makers on our Florida Keys Wedding Resource Page. 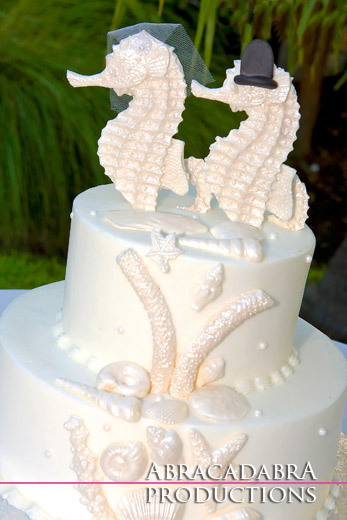 Next, check out dozens of photographs of bridal cakes in our Key West Wedding Details Section. It’s a good idea to have your wedding colors chosen before you decide on the colors for your cake. Wedding cake design is important and on each vendor’s web site you’ll find dozens of styles to choose from . When you come to Key West and The Florida Keys, visit the bakers who best meet your wedding style and they can custom design your fantasy wedding cake. Bring along wedding cake photos that you’ve clipped from magazines or printed from wedding web sites to make it easier to discuss your vision. Then, enjoy the taste testing! Another valuable Key West Wedding resource is The Key West Bridal Center. There you can find a Florida Keys Wedding Photographer and Florida Keys Wedding Videographer. Long after your wedding cake has been enjoyed, your wedding photographs and wedding film are the the perfect ways to look back at the special memories of your wedding day. The wedding photos and wedding video will become cherished family keepsakes to be passed down for generations. 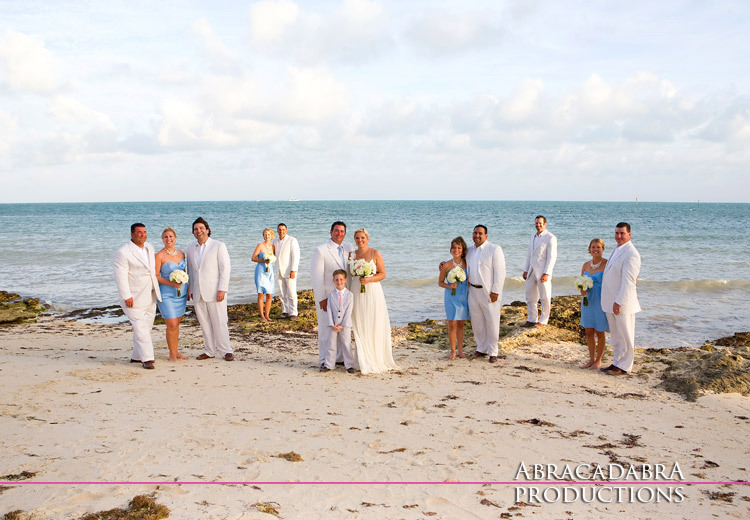 Abracadabra Productions specializes in Key West Wedding Photography and Florida Keys Wedding Videos. From engagement photographs to the capturing your big day the husband and wife wedding team, Gail and Craig Hollenback are your perfect choice. Their saying “we have to click before we can click” says it all. They only accept a yearly number of weddings that they can shoot themselves and like to meet with each couple so that they can get to know their special qualities. Gail and Craig met at Parsons School of Design in NYC where they graduated and were professionally trained in photography and design. Their shooting style ranges from photojournalistic to cinematic-style editing but always include the “must-take” shots. Below are just a few of their Key West Wedding Photographs and to watch wedding videos and see more Key West and Florida Keys wedding pictures please visit their web site at Abracadabra Productions.